First, for those of you that are not familiar with the masala dabba, let me describe it. A masala dabba is a round, stainless steel container that holds several removable bowls. The bowls are small enough to fit in the palm of your hand. Each of them holds traditional Indian spices, depending on the region you come from, and based on the spices and lentils you used in everyday cooking. My masala dabba saves me from hunting for spices when I’m ready to cook. Right in the center, in bold yellow, is turmeric powder (haldi). Ground turmeric is used to flavor and color Indian dishes. It has a warm, pungent, earthy aroma and taste. It comes from the ginger family, and it is the root of the turmeric plant that is dried, powdered and used as turmeric powder. Turmeric has great digestive properties and it is good for weight loss as well. I’ve even heard Dr. Oz sing its praise. In vibrant red is Kashmiri chilli powder (lal mirchi). It is moderately hot and it adds a rich red color to the gravy in curries. It is made from dried, ground red chillies seeds. A little goes a long way. The next item is coriander powder (dhaniya). It is the same plant as the cilantro, but coriander powder refers to the seeds that are dried and ground. It has a sweet and slightly tangy taste. Black gram dal (urad dal) is a lentil that is rich in protein and iron. It is used a lot in South India to make vadai, dosa, and idli. I use this to season my dishes. Next come mustard seeds (rai). These tiny seeds are powerful and they pop and add flavor to the oil. I use mustard seeds in almost every savory dish that I make. I guess I like it when they sputter in hot oil like applause at the opening of a show! Last, but not the least, are cumin seeds (jeera). These beige beauties are aromatic and have a nutty, warm flavor. The full potential of cumin seeds are released when you put them in hot oil and the air is filled with their fragrance. Seasoning the dal with cumin seeds is often the final step in making an Indian meal. No need to ring the dinner bell as the aroma of cumin seeds does the job. 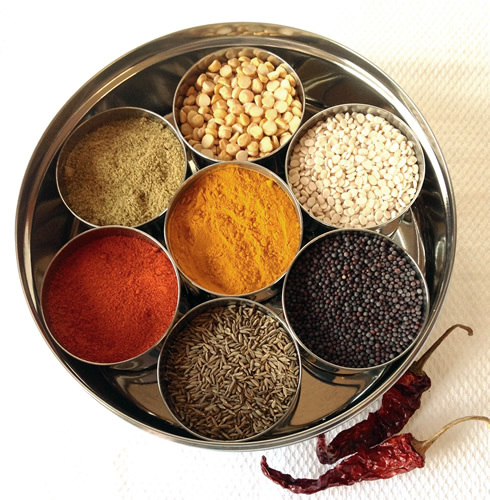 There is no rule as to what goes into your masala dabba. Create your own as you experiment and feel free to modify over time. Mastering the essence of each spice and lentil is a sign of an accomplished Indian cook.